It looks a lot like rock formations I’ve seen in Arizona and Utah… but then, the geologic processes that formed this region are similar. At some point in the past it was flooded with water, and looking at the layering this happened many, many times. The sediments built up and then were worn away over the eons, forming this gorgeous striped sedimentary rock. Inset here is part of the same scene with distances to various landmarks labeled [click to embiggen]. It looks like there’s the edge of a hill 230 meters away, and then it’s up, up, up, to a series of broad, eroded buttes 16 km away. That would be a fun day’s bike ride here on Earth, but it’s a long way for the rover. But that is the destination. And it’s not so much the goal as the journey that’s important here. The geology of this region is pretty interesting, and should reveal a lot about the history of the area including how it interacted with water (and what kind of water it was; probably very salty). 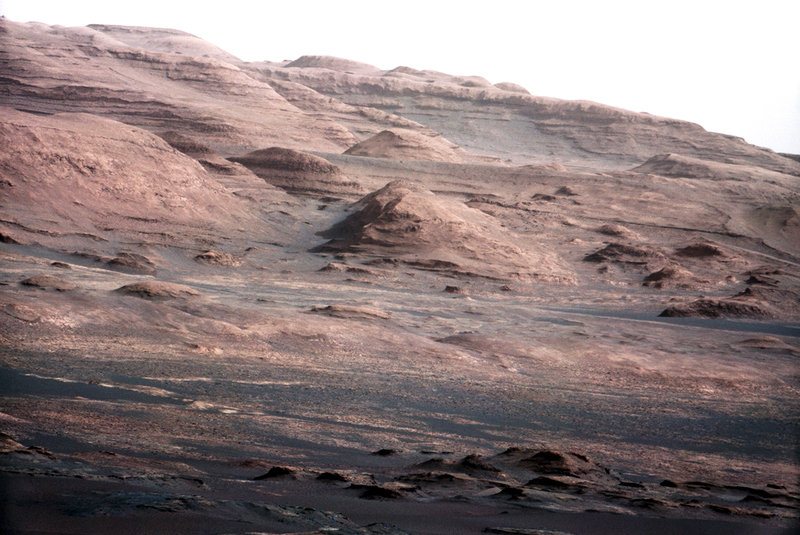 You should also take a look at this stunning hi-res wide-angle mosaic of Mount Sharp, too. It’s so wide that if I shrink it to fit the blog it would just look silly. So go look. These pictures are really exciting. The thing is, the first few times we sent landers to Mars they had to go to relatively boring places – not that any site on Mars is boring, but they had to be relatively flat and free of dangers to the terrestrial machines. 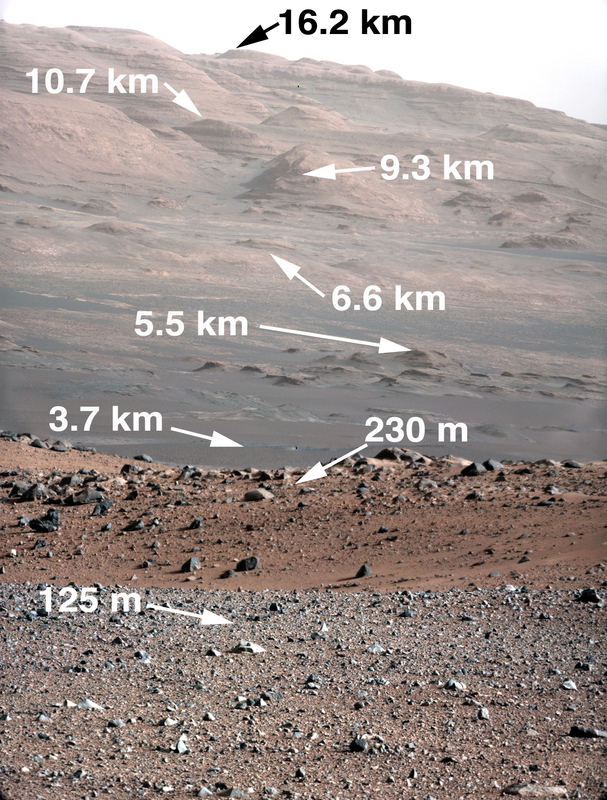 Curiosity is the first rover we’ve sent to a place that has real honest-to-Ares geology. I mean, look at it! It’s like the Grand Canyon. But it’s on Mars. The next couple of years are going to be very cool. – Curiosity spins its wheels!